« Thugs bring 12 year old along for home invasion. Many Russian politicians see Cossacks as a model for all Russians. Commitment to family, community, the church, and hard work has put the Cossacks in the center stage of a post-Soviet Russian national revival. A surprising article from BBC.. The Cossacks play an increasingly important role in Russia. Their disciplined way of life, patriotism, large families and commitment to work, are seen by many politicians as a model that could help resolve many of Russia’s problems. For this, they receive support from the very top. The village of Varennikovskoye is home to some 300 Cossacks and their families. The local leader, “Ataman” Viktor Vasilyevich, received me with open arms. He was dressed in traditional Cossack costume, which includes a full-length black coat, a sheepskin hat and a sword. He oozed authority, and it was immediately clear that he was held in deep respect by his family and the other villagers. 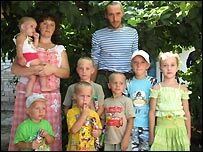 Cossack family life is a rigid, hierarchical system in which the eldest man’s word is law. Unashamedly, the Ataman explained that Cossack families should be as large as possible. He introduced me to one of his own sons, already the father of seven children. This entry was posted on Sunday, August 12th, 2007 at 12:56 pm and is filed under Uncategorized. You can follow any responses to this entry through the RSS 2.0 feed. Responses are currently closed, but you can trackback from your own site.